Chicks: Do they fledge all at once? Question: When a nestling fledges, does it just leap into the sky? Answer: Though we think of first flight as a dramatic leap, it’s actually a gradual process with baby steps along the way. The steps happen pretty fast compared to the time it takes a human baby to crawl, then walk. In about one week’s time, peregrine falcon chicks progress from the first big step off the nest to their first flight. Walking off the nest is a huge milestone because peregrines are hard-wired not to do it until their flight feathers have grown in. This safeguard is bred in the bone because they nest on high cliffs. One step too early would be their last. Those who tried it didn’t live to breed. 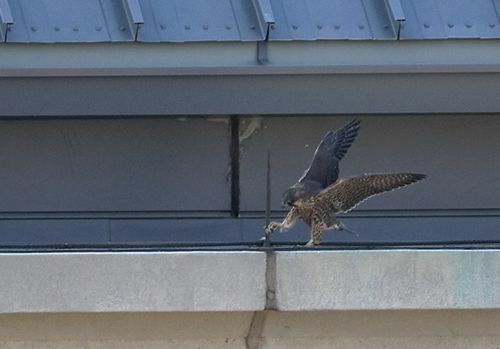 When peregrine chicks finally move off the nest they’re immediately in the ledge walking and flight-prep phase. Ledge walking is just what it sounds like. They walk or hop on the cliff ledges and explore by foot. Peregrines aren’t built for walking – their tails are too long – so they have to bow over to get anywhere. It makes them look like Charlie Chaplin without his cane. Sometimes they open their wings to hop or balance. Here a young peregrine checks out a lightning rod with his feet. Such a baby! Flight preparation involves flapping – a lot! They grip the edge of the cliff and flap at top speed, so fast their wings are a blur. Soon they’re tired and pause with wings outspread not even bothering to fold them. Though flapping looks silly, it strengthens their breast and wing muscles. It’s a tribute to their talons that they don’t levitate during this exercise. While all this is going on their parents watch them closely and encourage them to fly by flight demonstrations and carrying food out of reach. The flight demonstrations are spectacular: acrobatics, zooming fast, mock stoops and loop-the-loops. The better the acrobatics, the more the chicks flap. A newly fledged chick generally rests a while before flying again but his parents’ lives have just become more complicated. Now they have more than one location to monitor so they visit the sites in rotation to make sure their young are safe. Sometimes the only way to find a fledgling is to watch the behavior of his parents. Each chick fledges at his own pace unless forced to fly by danger at the nest. In that case, the situation is far from calm, the young may not be flight-ready and may crash into other ledges, break a bone or land in precarious places or on the ground. Fortunately those who nest on buildings have fewer threats to their safety.